The Samaritan Update, is a Bi-Weekly Internet Newsletter, a Division of The-Samaritans.com. begins Friday Feb. 27th, 5:36pm to Saturday 28th, 5:37 p.m.
Shalom b. Amram, the Samaritan High Priest is dead. The new High Priest is Elazar b. Tsedaka. The high priest of the Israelite Samaritans, Shalom b. Amram b. Yitzhaq, 82, passed away in Sheba Hospital, Tel Hashomer, on Monday, February 9, 2004, the nineteenth day of the Eleventh Month, after a very hard illness. Priest Shalom entered office in May 23, 2001 after the demise of High Priest Libi b. Abisha. The deceased carried out his duties faithfully and conducted the central ceremonies as well as the personal ones of the community. The last picture the late High Priest Shalom b. Amram blessing the peoples who attend the special evening in Tel Aviv, Israel where the Government of Israel and the Parliament of Israel salute to the Israelite Samaritan People - Photographed by Nir Shmul. 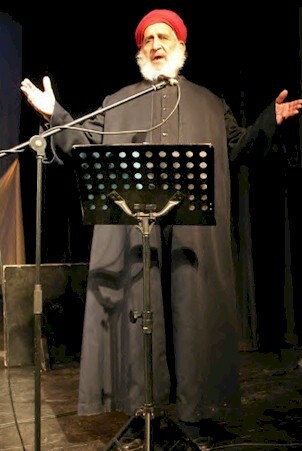 High Priest Shalom b. Amram was brought up in the Samaritan tradition from early youth by his predecessors of the priestly family. He was born in January 13, 1922 in Nablus/Samaria, and applied himself from an early age to practicing the Samaritan tradition. He devoted most of his time to his community, was unassuming, was always a lover of peace and was much beloved by the members of his community. The late High Priest served his community as a teacher of Samaritan tradition to the younger generation, as the community ritual slaughterer- the Schochet, and as a central cantor with a strong and melodious voice. He is survived by one son, two daughters and grandchildren. 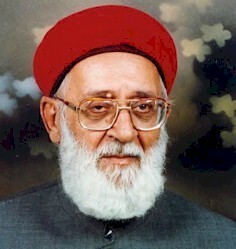 Around January 1996, when the election for the Palestinian Authority took place, Priest Shalom was among the three Samaritan candidates for the seat in the Palestinian Council reserved for the Samaritans, according to the decree of Chairman Arafat, who holds the Samaritan community in great esteem despite the small number of its members. Thousands of Palestinians gave him their support and he was elected to this special position. He represented his community faithfully and assisted many of its members through his connections with high officials in the Authority, particularly with Chairman Arafat who considered him a personal friend. On his 80th birthday, in 2002, the President of the State of Israel, Mr. Moshe Katzav, threw him a special birthday party in the presidential residence in Jerusalem. All of the high-ranking officials in Nablus were his closest friends. Thousands of mourners came from Judea and Samaria to his home on Mount Gerizim during the seven days of mourning to extend their sympathy to the community. On Tuesday 10.2.04, the Nablus Municipality opened a special mourning hall for a three-day duration, to be open three hours every day to many thousands of visitors who came to pay their respects. Since 1624 A.D. Samaritan High Priesthood is usually determined according to age. The oldest priest in the priestly family becomes the High Priest, whose residence is on the Mountain of Blessing. This system of election leaves no place to personal competition on this position among the priestly family of the Samaritans that holding the claim that the High Priest is elected from heaven. High Priest Shalom fell gravely ill last year with a cancer disease from which he did not recover. Last weekend he was rushed into Sheba hospital where his death was pronounced on Monday, February 9, 2004. At the same day at 3 p.m., he was brought to burial in the cemetery of Kiriat Luza on Mount Gerizim. Hundreds of friends and acquaintances accompanied him for the last time. The Palestinian Governor of Nablus mourned him with warm words of appreciation. The Israeli governor of Nablus, lieutenant colonel Raid Fares was also present. The President of the State of Israel, the Israeli Prime Minister, the Chairman of the Palestinian Authority, the Israeli Foreign Minister and Deputy Prime Minister and the Chairman of the Palestinian Legislative Council sent telegrams extending their deepest sympathy to the new High Priest. Hundreds of calls and condolence messages were received at the Chambers of the new High Priest and at the A.B. - Institute of Samaritan Studies from people from all walks of life and from friends abroad. Dozens of dignitaries from Nablus sent condolence gifts to the family of the deceased. "MOUNT GERIZIM, West Bank -- Saloum Cohen, high priest of the tiny Samaritan community and a Palestinian lawmaker, died yesterday at a hospital near Tel Aviv. He was 82." Etc. The remaining house of the sons of Phinhas, sons of Aaron, that the High Priesthood was allotted to, died out amongst the Samaritans in 1623/4. The last High Priest of this order was Shelemiah ben Pinhas (1613-24) died leaving no children to carry on the succession. He was murdered in a young age while traveling. Since that time the High Priest has been the oldest priest from among the Levites. If you notice the lengths of the duration of the reign of each of the priests are much longer than the reign of recent priests. This may demonstrate that there may have been fewer Levites amongst the Samaritan-Israelites from 1624. As the number of the Samaritan Israelites appear to increase from the 1900, also the shorter the reign of the High Priests. This may also be an indication not just that life expectancy has become much higher but that their number has become greater. Evidence from manuscripts have confirmed that the Samaritans were indeed small in number for some time. The number of Samaritans were estimated to be about 140 in seventeenth century. In 1908, the Samaritans numbers 155 souls. In 2003, the number increased to 654 souls, of which 186 are from the Priestly house. The below is a list indicated the reign of the High Priesthood amongst the Samaritan-Israelites. Know that every one of the Meritorious Ones had to suffer great troubles in his lifetime. These were trials from God to purify them from the sins of the world. Then he accepted their repentance and made them great in the world to come. Perhaps the letter ז is the initial of the word ןורכז, remembrance, that there shall be knowledge and reputation of them. And our master Markah- may God's favour be upon him- speaking of the Meritorious Ones, said, "The dead are like unto the living." And this is his saying, "Remember unto us the covenant of the dead like that of the living." And God knows. And another explanation of the letter ז (this is seven) is the Sabbath is the seventh (day), and that observance of it will purify man of his sin.\; and perhaps the explanation be that he is recounting the wars which happened in the days of the Meritorious Ones and the troubles which happened, came upon them to purify them, just as the Sabbath purifies those who keep it. And God knows. And this explanation will agree with the opinion of the masters of knowledge. It says in the Book Asatir, [the beginning of the wars of the dying with the living,] were the beginning of the wars, because the Lehadim, Enamin, Naftohim, Patrosim and Kaslohim gathered together with the others. And they chose for themselves a leader whose name was Gitt the first born of the Lehadim, which were called by his name, Gibtai. And they went from Philistia and made war first with the Canaanites and Perizites, and took the kingdom from the hand of Nimrod, and ruled from the land of Egypt unto the river of Kush. And Nimrod went (page 223) and pitched his camp against Gitt, and he asked the children of Joktan to help him against the children of Misraim and his seed. And the children of Joktan turned away and did not listen unto him, and went away until they reached a place for camping, of which it is said, "from Mesha until thou comest unto Sifra of the mountain of the East,) that is Timnata, whose name was called Yemen, Sifra, the mountain of the East until Timnata." And Gitt died in the land of Misraim, and when Nimrod heard of the death of Gitt, he rose up to fight the inhabitants of the town of Ashur, and that is the place called Almosa; and he ruled over it, and when he became king over it, he rose up and made war with Nahor. Religious Parties in Israel: Their History, Methods, and Perils by Abraham Burstein. Bloch Publishing Co. 1936, New York. 59 pages. Various groups within Judaism from Biblical days to present, such as Samaritans, Pharisee, Sadducees, Karaites, Hassidism, Kaskalah, Reform. Jewish Antiquities, or a Course of Lectures on the Three First Books of Godwin's Moses and Aaron. Vol. I, Concerning Persons. By David Jennings, Rivington, London 1823. A chapter of the Sadducees and Samaritans, Essenes, etc. Thank you! We would like to thank you for visiting our website, The-Samaritans.com in the past and hope you visit us again real soon. We ask you to forward this Update to your friends. The purpose at our web site is the education of the existence and history of the Samaritan-Israelites, descendants of the ancient Kingdom of Israel. Recently we have been working on expanding our web site. We do hope you enjoy visiting our site and recommend it to your friends. The-Samaritans.com .